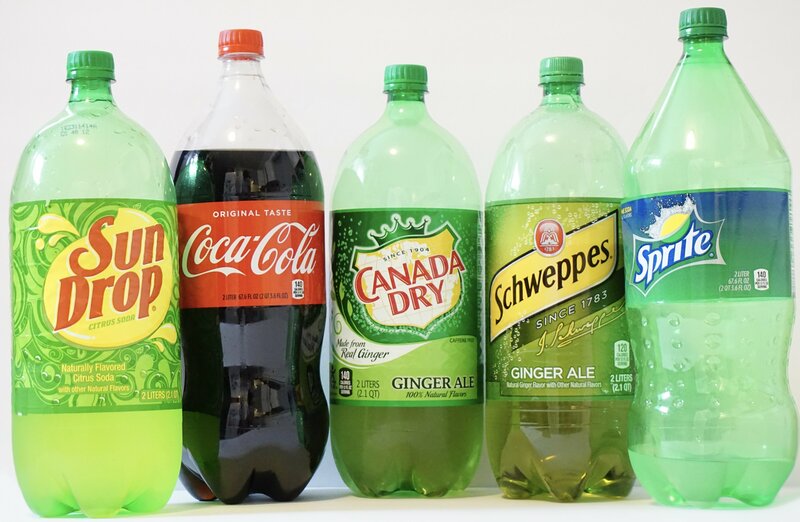 Do you have leftover 2-Liters from hosting holiday parties? 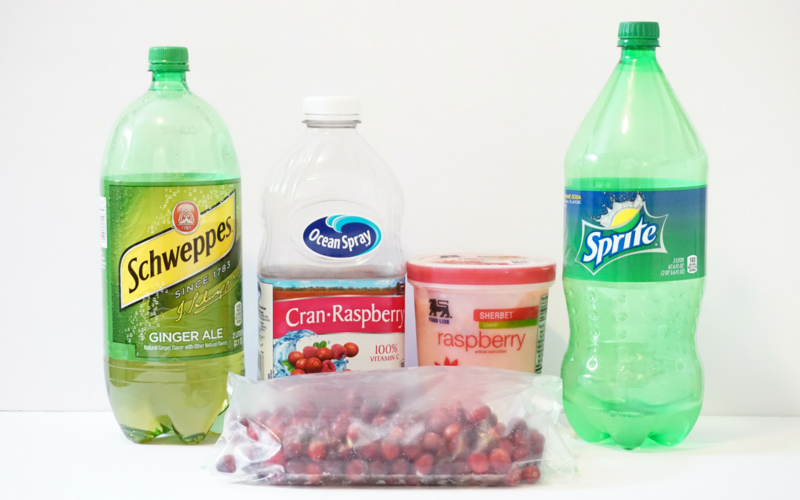 This delicious recipe uses Sprite and Ginger-Ale to make raspberry holiday punch. If you love raspberry flavors, you will love this champagne punch! I love making this around Christmas because of the red, festive color. Plus, there is usually champagne in the gift pile, half-used soft drinks and leftover cranberries from decorating. This recipe is derived from the yummy Cincy Shopper’s Holiday Punch. I took the lazy way out and did not puree the cranberries and raspberries into the punch. I only had cranberries so I only used those for garnish! Also, I forgot to refrigerate the drinks overnight so I only refrigerated everything for a few hours. To quickly chill the champagne, I just added the bottle to a cooler full of ice water for about 30 minutes. Another thing I love to do is freeze fruits to garnish wine or champagne cocktails. 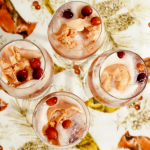 I popped some of the cranberries in the freezer and used those to garnish the drinks. That way, the drink stays cold longer without watering anything down. The ice cream sherbet really helps with that too! If you want an alcohol free or kid-friendly version of this, just leave off the champagne. Add a whole bottle of the sprite and ginger ale in place of the champagne. Additionally, you can make this a pretty New Years Eve champagne holiday punch by garnishing the glass with gold sprinkles. Other ideas to dress it up for the occasion include adding gold paper straws or gold foil cocktail stirrers. Otherwise, follow the recipe below for a mouthwatering champagne holiday punch! This is a fantastic champagne punch for Christmas and the holidays and a great way to use up leftover ingredients. Combine chilled Sprite, Ginger Ale, Champagne and Cranberry Raspberry Juice into a pitcher or punch bowl. 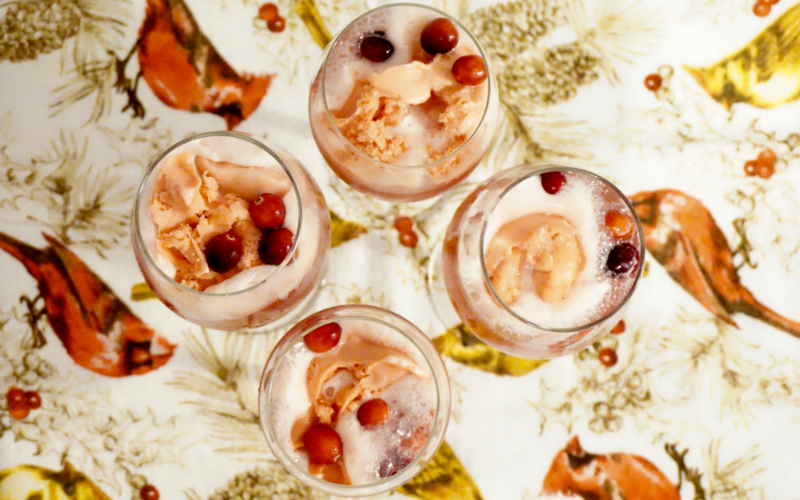 Add one scoop of sherbet and a few cranberries to each glass.